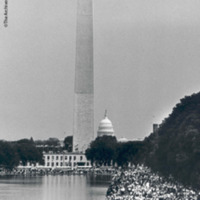 View of the Washington Monument during the 1963 March on Washington. 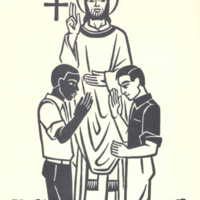 Logo of the Episcopal Society for Cultural and Racial Unity (ESCRU). 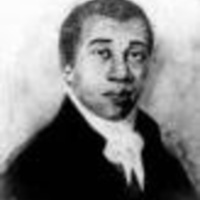 This famous image of Jones was rendered by Philadelphia artist Raphaelle Peale in 1810. 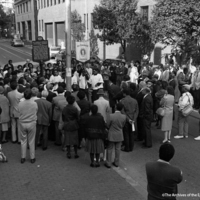 Dedication of the Pennsylvania state historical marker on the original site of the African Episcopal Church of St. Thomas, Sept. 30, 1984. 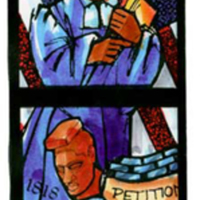 Stained glass window in St. George's Episcopal Church, Dayton, Ohio, crafted by Willet Stained Glass in 2000. Image courtesy of St. George's Episcopal Church. Portrait of Richard Allen at age twenty-five years by unknown artist, 1784. Image courtesy of Moorland-Spingarn Research Center, Howard University. 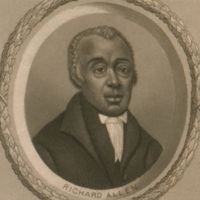 Portrait of Richard Allen taken from a lithograph entitled "Bishops of the A.M.E. Church", c. 1876. 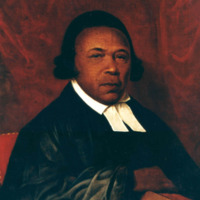 Image courtesy of the Library of Congress, Prints and Photographs Division. 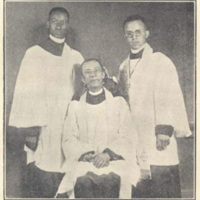 The Reverend George Freeman Bragg and two of his "ministerial sons," 1922. "A History of the African Episcopal Church of St. Thomas," September, 2006. Courtesy of the Archives of the African Episcopal Church of St. Thomas.